Ketubahli’s founder Anita Tidhar was born and raised in Hungary, she immigrated to Israel at the age of 25, although she came from a secular house she had an immediate connection to the land of Israel. It felt like that she was meant to be there. While growing up in a sleepy little Hungarian town she has spent most of her summer days in the art studio of her late uncle, a well-known Hungarian painter, where she fall in love with colors and papers. 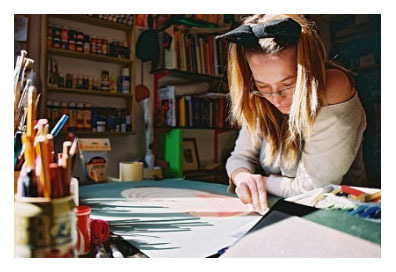 She started drawing regularly as a teenage girl, than gave up art to pursue a more traditional path and earn a degree in Sociology and Journalism.It was only after arriving to Israel that she felt urge to paint again. 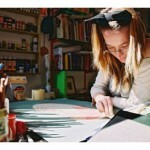 Her very first ketubah was created for her own wedding, inspired by the beautiful artworks of a fellow ketubah artist. The word spread slowly and soon friends and friends of friends started commissioning Anita’s works. In 2008 Ketubahli was born. Today Anita, under the name Ketubahli sells her work all over the world from the US through Europe all the way to Asia.She uses mixed media on specialty paper. Her favorite is the Amate paper, a hand made tree bark paper made by indigenous Mexican tribes, which she loves using as a background. Her motifs often reflect far away places and cultures she was fortunate to visit.Anita uses acrylic and watercolor mixed with 18/24 krt gold gilding.